With that in mind, it’s time to pull out the classic chestnut that us bloggers commonly use when either (a) we can’t figure out what else to write about or (b) our regular jobs have managed to keep us busy enough to the point where we end up amassing all this great content over the year gone by and need to figure out some way to make that content relevant again (guilty as charged, sigh): the “year in review” posts. So yes, for the few dozen of you who have managed to stick around reading this blog for this long, this does mean that I’m trying to get photos from Kawaii Kon, HEXXP, Mini Con and the Windward Mall Anime Day up sometime soon…ish. But as I was typing out the working titles for those year-end posts, I noticed something: For a blog that tag-team partner in fandom Wilma J. and I started several years ago to talk about anime and manga … we really haven’t been talking all that much about anime and manga as of late. Notable for its absence from the queue, in fact, is any sort of “anime/manga year in review” post. Collectively, we just haven’t watched or read enough of the stuff this year to have any sort of commentary on it. But if anything, I’ll remember 2012 as the year anime/manga-inspired art and cartoon art took over a good chunk of this blog. Easy to do, really, when you have groups like MangaBento, Pen & Ink Works and Comic Jam Hawaii producing such great artwork. There were several spotlight events for that art, too, including MangaBento’s Nakamaboko exhibit at the Honolulu Museum of Art School (featured in this space in a three–part series) and the still-in-progress call for entries for the Liliha Library Anime Art Contest. It has come to my attention that there have only been a handful of submissions to this year’s Liliha Library Anime Art Contest. We’re talking waaaaaaaaay-down-from-the-past-two-years handful. To which I say, umm, hello? Copic markers? Wacom Bamboo tablet? Other great art supply swag? Don’t you people want this stuff? I mean, it’s great that those who have entered so far may have the best chance of winning in this contest’s three-year history, but your esteemed panel of judges — myself, nemu*nemu artist Audra Furuichi, Kawaii Kon senior administrator Roy Bann — would like to have a bit of a challenge picking the winners. That’s right, interest in this contest in the past was so great, we added a judge this year to handle the volume of entries. And as of now, with the number of entries in hand, it looks like we could render a verdict in … mmmm, three minutes? I mean, sure, Audra and I appreciate the help, but we were expecting to go from an hour down to 45 minutes, not five minutes down to three. So yeah. Don’t make us sad. You wouldn’t like us when we’re sad. There are two more days — Saturday and Monday — to turn in those entries, so read up on the rules, tromp on down to the library at 1515 Liliha St., and go encourage the students in grades 6 through 12 in your life to get cracking. … and now, back to my year-end retrospective, already in progress. … happy new year, everyone. For those of you who are still procrastinating on getting a gift for the gamer in your life, I’ve got a great suggestion: Professor Layton and the Miracle Mask! Yes, you knew this was coming — particularly because, well, this, this and this — and here it is. But for this latest Layton series game, which was released Oct. 28, I’ll skip my unofficial tradition of recounting how insane I went trying to get the game on release day (mostly because I didn’t go as nuts this time around). I will say, however, that a certain store advertised it in its circular, I rushed to said store and got there before it opened, and there was one other customer actually trying to find the game along with me because it wasn’t out on the shelves, so we had to bug two separate sales associates, and the store had only 5 in stock, and WE SNAGGED TWO OF THEM. In Miracle Mask, the titular professor Hershel Layton once again receives a letter from an old friend, this time from one Angela Ledore, whom he hasn’t heard from in many years. She talks about a personage calling himself the Masked Gentleman — and he does indeed wear one — who is terrorizing the desert oasis of Monte d’Or, a Las Vegas-type city that her husband, Henry, helped build from scratch into a haven of glitz and glamour in a mere 18 years. Angela, who was like a sister to Layton in his youth, asks the professor to investigate before these actions destroy the town. The Gentleman has been performing what he terms “dark miracles” — events that include the apparent transformation of people into horses, a cage full of Monte d’Or residents going up in flames but with those same people later found at home unharmed, and paintings suddenly coming to life with their subjects running out into the streets and wreaking injurious havoc. 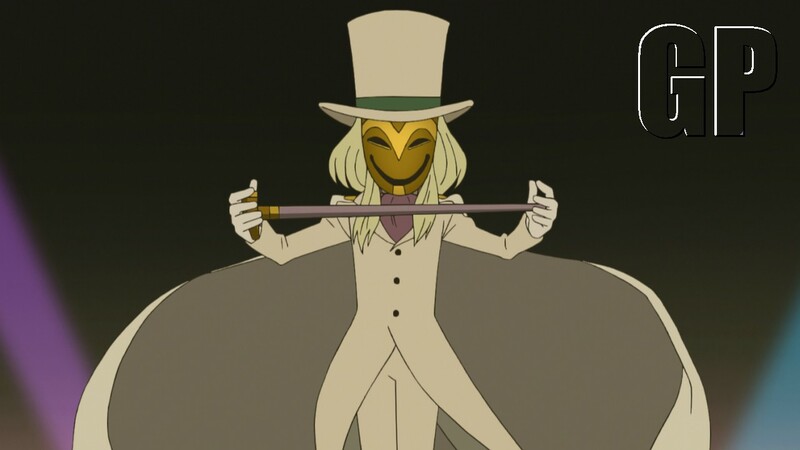 But what really clinches things for Layton is the mention of the Gentleman pulling off these stunts with the power of something called the Mask of Chaos — a relic from an ancient civilization and one that has a very personal connection to the professor. Miracle Mask is the second prequel game, coming after Last Specter and before the animated movie Professor Layton and the Eternal Diva. Layton’s assistant from Last Specter, Emmy Altava, returns here along with his self-appointed apprentice, Luke Triton. controls take a bit of time getting used to. i kept tapping the suitcase when i wanted to move, as the move “shoe” icon was located there in previous games. Within the first 15 minutes of the game, you’re treated to a bevy of new controls and animation. In-game characters are now drawn in 3-D (without needing to use the 3DS’s built-in ability), and although it’s strange at first, it grows on you soon enough. Most cut scenes are still done in the old 2-D style, but some scenes using the 3-D figures do come later in the game. They’re well done and the characters move as fluidly as in the regular 2-D animation, though they still give a sense of being slightly stiff marionettes. Moving around town is a bit simpler. Instead of a Shoe icon as in previous games, a map of your current location and adjacent areas appears on the 3DS’s touch screen. Places you can move to are marked as orange dots; touch the desired dot to move there, and the location will show up on the upper screen. In this way, you move through Monte d’Or. However, exploring is a little more complicated than before. Along with the familiar Trunk icon on the touch screen is a magnifying glass, which is the Investigation icon. To check around an area, first you must tap that magnifying glass to enter Investigation mode, which causes a corresponding glass to appear on the upper screen. Instead of tapping madly, you now slide the stylus on the touch screen to move the magnifying glass over the area. The glass will turn orange when you land on something of interest; tapping on it then reveals a person with something to say (and very likely with a puzzle to throw your way); a distinct feature of the town, with commentary from Layton, Emmy and Luke (and all three of them WILL comment); a hidden puzzle or treasure; or a hint coin. Sometimes the glass will turn blue, denoting a place to zoom into. Zooming in uncovers deeper areas, along with more people and treasures. Adding to the complexity: Locations now extend beyond the dimensions of the 3DS’s physical screen, so you need to move all around while in Investigation mode to see everything possible. This could prove slightly dizzying if you’re like me, wiggling the magnifying glass all over everything to try to find every nook and cranny where the glass might turn orange or blue and reveal secret items. The controls do take some getting used to. Because of the disconnect between the movement of the magnifying glass and your control of it, and because of the lag the 3DS has in responding to stylus movements, it can be hard to home in on points of interest if, like me, you slide the thing around rapidly and keep passing over the precise point where the glass turns orange. You now have to double-tap to grab hint coins, and it’s difficult to keep the magnifying glass in the same place to do so. I also kept accidentally tapping the Trunk icon when I wanted to move to another area, as the Shoe icon was located in that spot in previous games. Then there are the puzzles themselves. The mandatory, zero-picarat “puzzles” that must be solved to advance the game make a reappearance — mostly in the form of multiple-choice questions as Layton and the police are dissecting the Masked Gentleman’s “miracles” — and there is no loss if you don’t quite solve it the first time around. Other puzzles are standard Layton franchise fare, and none (that I’ve found so far) take advantage of the console’s 3-D ability. What they have added are mostly aesthetics: The puzzle and the space to input your answer will be on the touchscreen, and some kind of animation will often be on the upper screen — such as little statues of cats jumping over each other when trying to clear a board of all but one statue, or pizza slices flipping upside down and right side up as you try to get the entire pizza facing the correct way up. Because of this, the text of the puzzle is hidden, though you can easily pull it up again by tapping on the arrow to make it appear on whichever screen you choose. It makes for a little extra work, but it’s also handy to be able to write down answers as you might think of them. But similar to investigating areas, there’s a disconnect in the controls in some puzzles, such as one in which you must guide a ladybug around a corncob that has had pathways “eaten” into the corn. The corn and ladybug appear on the upper screen, while on the touch screen there is a “dial” that rotates 360 degrees and that is used to direct the ladybug’s movements. Again, the lag in reaction time means you often find yourself smacking the bug against a wall of corn or missing the intersection you wanted to take. It’s a good thing running into corn is harmless in this case, as opposed to, say, trying to maneuver the bug around a maze atop lava and trying not to fall off the edge into the lava below. And, of course, there are the usual mini games found in the Professor’s Trunk. This time, you have to train a lazy rabbit to perform actions in stories on stage so the circus ringmaster will allow him back into the circus. (After awhile, your rabbit becomes your hint-coin-finding helper, appearing every so often to warn you of coins that you missed in a particular scene. However, the rodent’s more useless than animals in previous games because all it does is pop up in the corner and doesn’t point out the exact location of the coin.) Another is a robot game in which you must guide a toy robot to land on a goal while avoiding enemies. The last is the one I had the most fun with: a shop game in which you arrange items on the shelves in such a way that the customer will be enticed into buying out the entire stock in one fell swoop. Successfully complete the mini games to unlock more difficult puzzles in the Bonus section. But the most fascinating part of “Miracle Mask” is the Ruins Mode, which is more of an action-adventure that’s easier to play using the D-pad and buttons. The Ruins are an integral part of the game, so without giving too much away, I will say that the first few rooms offer a tutorial into how to make your way through the Ruins, although the first room you come across with an obvious solution to veteran adventurers is painful as you watch Layton go through the motions of being at first unable to solve it. Ruins Mode is where the game really gets exciting because it’s so different from the usual puzzles. (Plus, those mummies are actually kind of scary. My heart was pounding when they closed in on me as I tried desperately to run to safety.) The concept is simple: Each room has a mixture of enemies, obstacles, switches and rocks, and you must use some things and avoid others to get to the door at the other end of the room to advance. Hint coins are occasionally buried in the ground, marked quite obviously by a glowing yellow light. The Ruins are also a turning point in the story, when you discover exactly what happened that affected Layton — and indeed his entire life — so drastically. And ah, the story. Perhaps I’m getting a bit desensitized to the plot lines in the Layton series, but in this regard the series seems to be failing. While uncovering the secrets within Monte d’Or is certainly engrossing, the denouement is more of a disappointment now than in previous games. Instead, they seem to be focusing on the larger, overarching story — if you recall the end of Last Specter, you know there’s something bigger going on, and the end of Miracle Mask advances that. It’s really the promise of how everything comes together in what’s supposed to cap this second Layton trilogy that’s making me look forward to the sixth game — no longer is the prospect of solving more brain teasers as much of a draw as it was when I first discovered this series. In fact, I haven’t downloaded a single daily puzzle — oh yes, there are daily, rather than weekly, downloadable puzzles in Miracle Mask — nor have I been as eager to go back and find all the hidden puzzles and solve all the 80-picarat brain-busters. I haven’t even been tempted to enter the secret code from Last Specter to unlock the mystery goodies. The difficulty of the puzzles seems to be ramped up in this game — I probably used more hint coins in this game than the previous five combined — which might also explain my dampened enthusiasm for unlocking all of them. Overall, I still enjoy the series. The great interactions between Layton, Emmy and Luke, the dialogue of other characters, and the excellent voice acting make “Miracle Mask” another worthy addition. But the series also seems to be wearing out its welcome. (For one thing, just how many depressing things can we believe the professor’s gone through without snapping?) 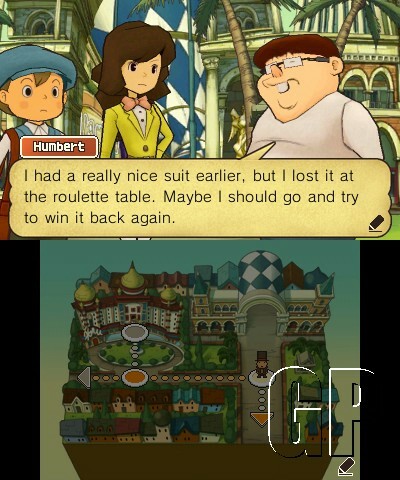 The fan in me is more than a little ready to move on after the sixth game … or perhaps to Professor Layton vs. Ace Attorney, Capcom? Level-5? Just a suggestion. Another quick Cel Shaded Report for this week — working on a year-in-review post (or several) that hopefully will see the light of day next week, assuming there aren’t any other big breaking news stories or the world hasn’t ended due to Mayan apocalypse. Speaking of breaking news stories that aren’t related to anime, manga or cartooning, if you have some time to browse, please check out our special section on Sen. Daniel Inouye. Many good people spent long hours putting that section together this week and on short notice — a bunch whose names aren’t in the paper, at that — so kudos to all of them. Also: Merry Christmas! Tag-team partner Wilma J. and I wish all of you and yours the best this holiday season. Aiea Library Anime Club: 3 p.m. Saturday at the library, 99-143 Moanalua Road. This month, librarian Diane Masaki is going holiday festive in screening Tokyo Godfathers, the story of three homeless men who find an abandoned newborn on Christmas Eve. For more information or to RSVP, call 483-7333 or e-mail aiealibraryanimeclub@yahoo.com. MangaBento: This group of anime- and manga-inspired artists meets from 1 to 4 p.m. Sunday at the Honolulu Museum of Art School, 1111 Victoria St., Room 200. Visit www.manga-bento.com for more information. Liliha Library Anime Art Contest: Ten days left for submissions in this year’s contest — deadline is Dec. 31 — with its theme of “Books: Imagination at Work.” Audra Furuichi has all the details you need over on the nemu*nemu blog, so get to it and get to creating. Kawaii Kon: Applications for fan panels are now being accepted at www.kawaii-kon.org/events/panels through Jan. 1 for next year’s convention, happening March 16-18. As an added incentive, if you are approved for three hours’ worth of panels, you and an eligible co-host can get free three-day passes to the convention. “Art with a Heart”: Buy a hat, T-shirt, hoodie, bag, or TOM shoes from 10 a.m. to 2 p.m. Saturday at Whole Foods Market in Kahala Mall, and local artists — including Michael Cannon of Comic Jam Hawaii and Jon Murakami, artist behind Gordon Rider, our paper’s Calabash strip and a number of children’s books and greeting cards — will draw original designs on them for donations of $5 or more. All those donations, in turn, will go to Aloha Harvest, a nonprofit group that helps feed the hungry locally. Pen & Ink Works: This group of anime- and manga-inspired artists is getting together for a Sketch Meet from 11:30 a.m. to 1:30 p.m. Saturday at Liliha Library (1515 Liliha Street). Bring your sketchbooks, get some drawing advice from senior members, and get ready for a fun time. (And if someone you know is in grades 6-12, maybe they can even gain the foundation for something for the Anime Art Contest. There’s still time to enter something before the Dec. 31 deadline; Audra Furuichi has a few more rules detailes over at the nemu*nemu blog.) Visit peninkworks.wordpress.com. Comic Jam Hawaii: It’s another double-dip weekend for this group of collaborative cartoon artists as they descend on Aiea Library (99-143 Moanalua Road) from 2 to 5 p.m. Saturday and their regular haunt in front of Hot Unique Imaging, on the Uptown side of Pearlridge Center, from 1 to 4 p.m. Sunday. Special note: Sunday’s jam will be the last one for the group this year, and group leader Michael Cannon will be be bringing all the group’s drawings over the year to give away, so KYAAAAH FREE ART FREE-FOR-ALL GO GO GOOOOOOOO. Visit www.facebook.com/groups/147779161986428 (Facebook login required). There haven’t been many anime series that have lit the ol’ “hey, pay attention, this is garnering quite a bit of attention on the fan scene” light on my anime-monitoring radar as of late. And for good reason: With the fan base as fractured as it is, more into things like Adventure Time and My Little Pony: Friendship is Magic and the Homestuck web comic and the Internet meme flavor of the moment than anime anime. Gone are the days when you could have big-time series like Naruto or Ouran High School Host Club or Hetalia unifying the masses; these days, it seems like there’s Pokemon, and then there’s a billion subsets of fandom. 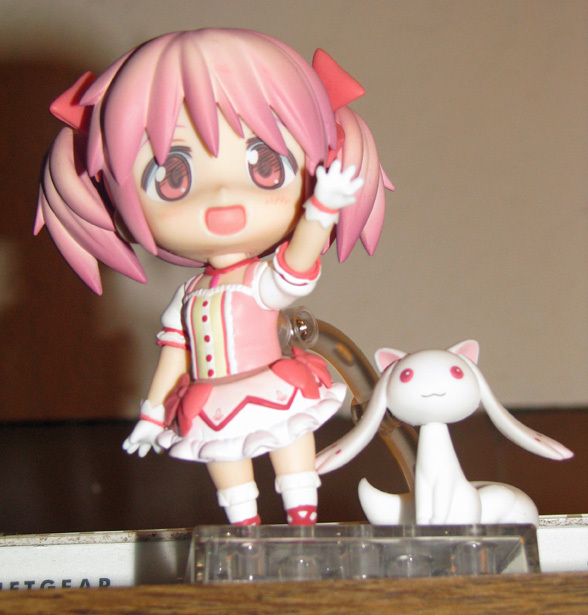 I have, however, heard more than my fair share of good things about Puella Magi Madoka Magica. It’s a mahou shoujo (magical girl) series that follows the triumphs and trials that high school student Madoka Kaname finds when Kyubey, a magical creature, offers her a contract to become a magical girl and fight the Witches who plague the world. Sure, she can get one wish of hers granted if she enters into the contract, but the burdens that she must take on and the despair of the world that she must see in doing so could be far too much for her to bear. But some of you may not have the time to spare to digest five hours worth of TV show. That’s OK, because Shaft, the studio behind Madoka Magica, has you covered. In October, Shaft released a pair of compilation films, Beginnings and Eternal, with a total running time of … four hours. (A third film with new story content, Rebellion, is due out in 2013.) So yeah, watch the films, and you can save an entire hour of your life for other things! Yay? And then on Thursday, two screenings popped up on the Honolulu Museum of Art website. Scheduled for 4 p.m. Feb. 27 and 28 at the Doris Duke Theatre, at that. And the people rejoiced. Oh, yeah, and if there are any readers of this blog in Greensboro, N.C., you’re getting it, too. But mostly YAY US. If you want to get in on the fun, tickets are already on sale for $20 general admission, $18 Honolulu Museum of Art members. First 20 people each night will get a limited-edition poster. Just remember, it is two movies’ worth of content you’re getting in one night — with an intermission in between — so be ready to settle in for the long haul. Point your browser of choice at http://www.honolulumuseum.org/events/films/13340-puella_magi_madoka_magica_parts_1_2 and go from there. Bosch and Eyeshine join previously announced guests Todd Haberkorn, Colleen Clinkenbeard and Lisle Wilkerson — voice actors one and all. Kawaii Kon is March 15-17 at the Hawai’i Convention Center; three-day general admission passes are $48 ($38 children ages 5-11) through Feb. 28. Visit www.kawaii-kon.org.